Welcome to the website for Notting Hill Methodist Church, a warm and welcoming congregation in the heart of Ladbroke Grove. 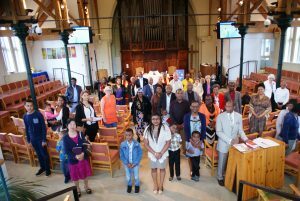 We worship together every Sunday at 11am, and services are open to all ages and backgrounds. During Lent we have evening services at 6.30pm – these are quiet, contemplative services with prayer, music and a short address. Browse other pages on our website for more details of our worship services, weekly fellowship and community activities, and for latest news and updates. The foodbank is now open on Tuesdays between 11am – 1pm and on Fridays between 1 – 3pm. Our telephone number is 020 7229 7728.